If David Bowie and Prince had a love child, it would be this character. GREAT book for anyone who likes Terry Pratchet or Douglas Adams. 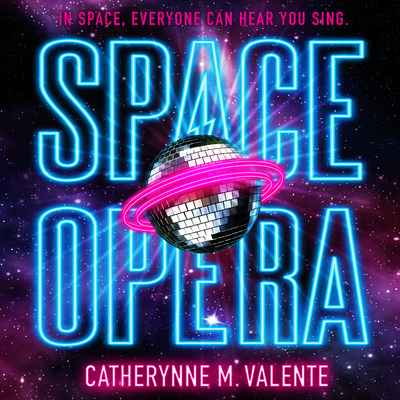 The Hitchhiker's Guide to the Galaxy meets Eurovision in an over-the-top galactic science fiction spectacle from bestselling author Catherynne Valente where sentient races compete for glory in a universe-wide musical contest-where the stakes are as high as the fate of planet Earth. A century ago, the Sentience Wars tore the galaxy apart and nearly ended the entire concept of intelligent space-faring life. In the aftermath, a curious tradition was invented-something to cheer up everyone who was left and bring the shattered worlds together in the spirit of peace, unity, and understanding. Once every cycle, the civilizations gather for the Metagalactic Grand Prix-part gladiatorial contest, part beauty pageant, part concert extravaganza, and part continuation of the wars of the past. Instead of competing in orbital combat, the powerful species that survived face off in a competition of song, dance, or whatever can be physically performed in an intergalactic talent show. The stakes are high for this new game, and everyone is forced to compete. This year, though, humankind has discovered the enormous universe. And while they expected to discover a grand drama of diplomacy, gunships, wormholes, and stoic councils of aliens, they have instead found glitter, lipstick, and electric guitars. Mankind will not get to fight for its destiny-they must sing. A band of human musicians, dancers, and roadies have been chosen to represent Earth on the greatest stage in the galaxy. And the fate of their species lies in their ability to rock.